In addition to this week’s new comics, we’re starting off the new year by catching up on a bunch of comics that came out over the last 3 weeks as well. Also, in case you missed it, here’s my list of the 25 Most Interesting Comics of 2014. One of Europe’s most acclaimed graphic novels finally gets a proper English edition. 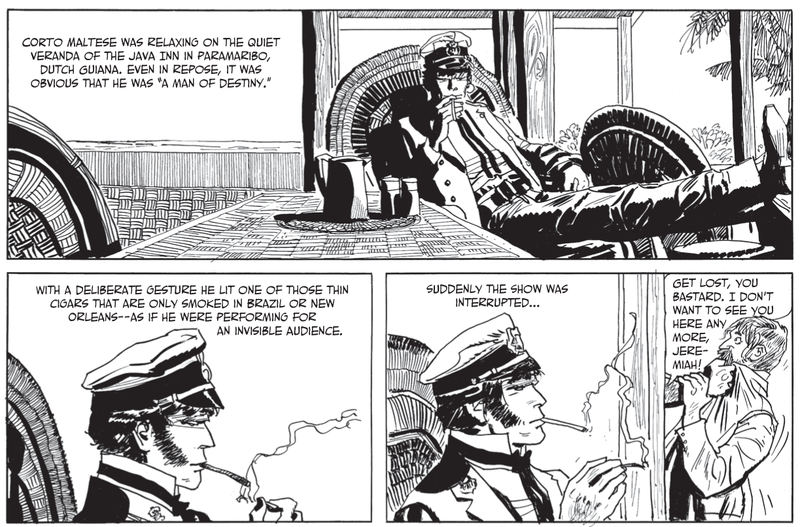 Hugo Pratt’s Corto Maltese, first published in Italian and French in the 1970s, is one of the great European comics, but it isn't widely read in the States due to a lack of English editions. Set at the beginning of the 20th century and jumping from one exotic locale to another, it follows the exploits of an enigmatic sailor named Corto Maltese and the international cast of characters he encounters in his travels. These are sophisticated, literary adventure stories that delve into complex geopolitical issues (along with a good bit of magical realism) and Pratt, who poured a lot of research and personal experience into each strip, populates the stories with memorably drawn characters. In 2012, an Italian comics publisher released what was hoped to be the definitive English edition, but instead it was something of a disaster. Excited fans were appalled to find the book was created with low-resolution art and reformatted—sometimes cropped—panel layouts (which, to be fair, mirrored a lot of the European editions). This time, IDW Publishing and The Library of American Comics (branching their comics archiving work into European comics for the first time) hope to have that definitive edition everyone has been pining for with this first of twelve planned volumes. Admittedly, the drab cover design with its very Photoshopped drop shadows looks like another misstep from the outside, but the inside reveals pages that are elegantly reprinted in their original oversized, black and white format on a heavy cream-colored paper stock, allowing you to truly admire the richness of Pratt’s shadow-drenched brushwork. Trickier than telling if the pictures are handled properly is judging the quality of the translation. University professor Simone Castaldi took the challenge of adapting Pratt’s original Italian scripts for this edition, attempting to convey the elliptical and almost poetic nature of the writing, something that can not be handled by a simple word-to-word translation. 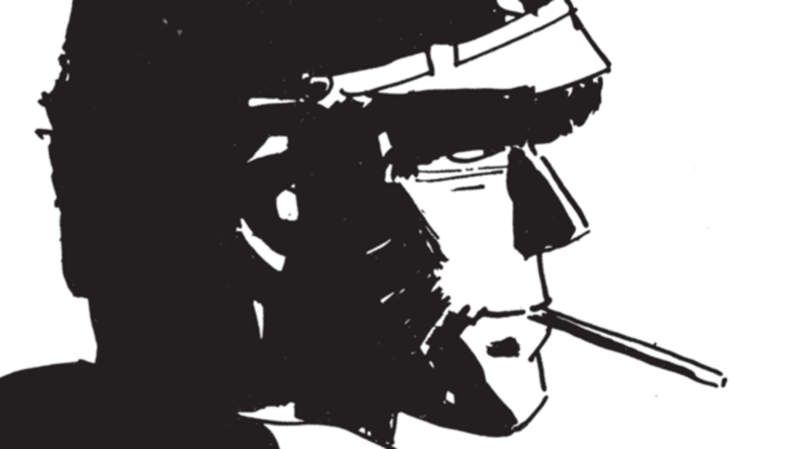 Corto Maltese fans well-versed in Pratt’s original writing will have to be the judge on how well Castaldi has done. A biography of the man who reshaped New York shows you exactly what he created. If you’re like me and have always wanted to read The Power Broker, Robert Caro’s 1300-page biography of Robert Moses, but can’t muster up the stamina, then Nobrow Press has a nice option here. French comics veterans Pierre Christin and Olivier Balez’s new graphic novel is a cursory look at Moses’ life and accomplishments that is less detailed than Caro’s tome but benefits greatly from the visual nature that the medium affords. Robert Moses was the most famous and controversial urban planner in history, responsible for New York landmarks like the Verrazano Bridge, the Cross Bronx Expressway, and Jones Beach. He believed in the future of the automobile and remade New York to make it and its environs more accessible by road. 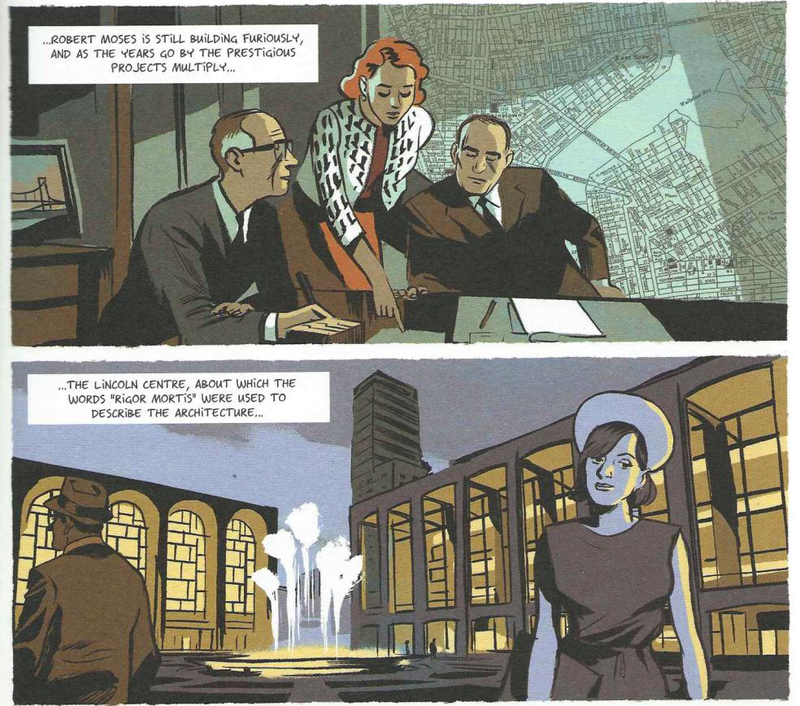 Olivier Balez evokes mid-century New York with a style that is similar to Darwyn Cooke's work on the Parker crime fiction books set in a similar era. While Balez and Christin hit on at least some of the good and bad in regards to how Moses' plans for urban progress disrupted many black and ethnic neighborhoods and treaded upon the cultural history of the city, the book shines when Balez is actually showing us the transformation Moses was responsible for through stunningly gorgeous drawings of his many monolithic architectural structures. What if Betty Draper were secretly a contract killer? It’s hard to avoid describing anything that takes place in the 1960s these days as “Mad Men meets…” but I think you can definitely describe this new mini-series as Mad Men meets FX’s The Americans. Set in the 1960s and playing off the domestic role that women were forced to play in that era, it follows a Betty Draper-like housewife who is actually a cold and ruthless contract killer. She takes on jobs while also trying to keep her house in order and keep her nosy mother-in-law off her trail. Jamie S. Rich and Joëlle Jones are frequent collaborators whose most notable book together was the wonderful romance graphic novel 12 Reasons Why I Love Her. Although Jones’ slightly exaggerated, modern drawing style may not immediately harken to the 1960s the way Olivier Balez's work does in the Robert Moses graphic novel above, she excels at drawing female protagonists and nails the fashion and setting of the era, not to mention all the gruesome bloodshed. Dark Horse has a preview here. An unlikely female hero with squirrel-based powers gets her own series. Squirrel Girl was a throwaway character co-created by the great Steve Ditko back in 1992 for a story in a generically titled comic called Marvel Super-Heroes. 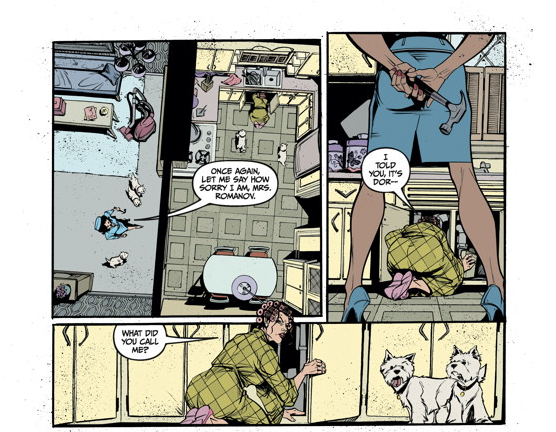 No throwaway characters are ever completely thrown away in comics anymore though, and Squirrel Girl has been brought back a number of times since then, first as part of a revival of another gag concept—the ineffective Great Lakes Avengers—and then later when she got a job as Luke Cage and Jessica Jones’ nanny in New Avengers. 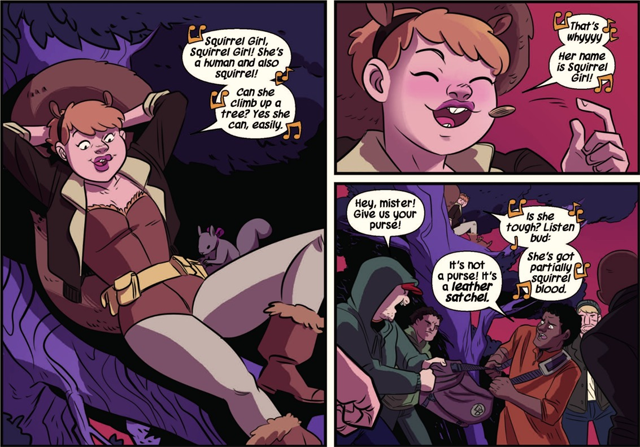 Something about Squirrel Girl, who has the proportionate strength and agility of a squirrel and can also talk to them, has broken her into cult status over the years, and now Marvel is going to test her fanbase by giving her an ongoing series. They’ve tapped an interesting creative team of Ryan North (of the webcomic Dinosaur Comics as well as the popular Adventure Time comics), newcomer Erica Henderson, and colorist Rico Renzi (FBP). That team doesn’t look a lot like your typical creative lineup for Marvel, and it shows in these previews. This type of quirkiness, geared towards young girls and far removed from the epic seriousness of most of today’s superhero comics, is something Marvel and DC have tended to steer away from in the past because it didn’t fit with their perception of what their readers wanted. But the comic-buying audience has changed (or maybe that original perception was always wrong) and both companies are finally seeing that now. Some cute fungi talk about email, Facebook and God. James Kolchaka is an indie comic veteran and webcomic pioneer best known for his long-running daily autobiographical strip American Elf. His work combines expertly crafted cuteness with insight into life’s relatable little moments. 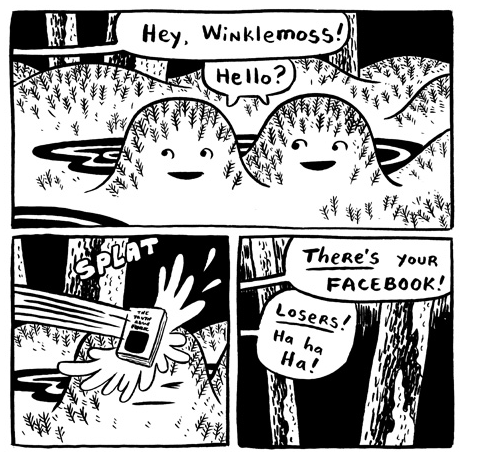 His newest collection of strips, called Fungus, has a bunch of cute, cartoon fungi walking around pontificating on subjects like email, God, Facebook, and even comic books. Their enthusiasm about these things, despite totally lacking an understanding of them, is endearing, while also making you wonder about your own enthusiasm for the same things. Fungus comes as a perfect-bound 108 page book from small-press publisher Retrofit (that normally prides itself on dealing in stapled, pamphlet-style comics but occasionally goes a little bigger). You can order a copy here. A young girl goes on a journey, questioning everything she sees. Miss Lasko Gross came onto the scene a few years back with a couple of semi-autobiographical comics—Escape from “Special" and A Mess of Everything. Those introspective works about being an outcast in high school make her an unlikely author for a new fantasy book (potentially the first of a series) starring an anthropomorphic cat-girl. Gross comes at this sort of material in her own thoughtful fashion, though. 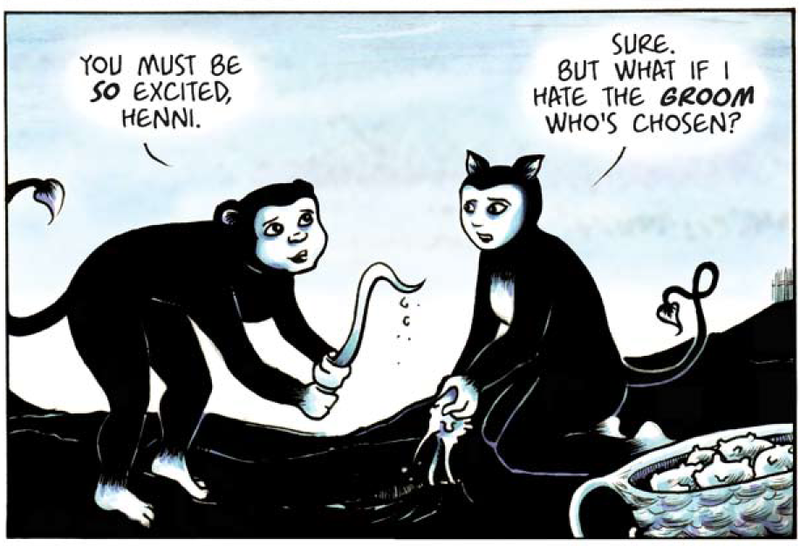 Henni is set in a world run by a close-minded religious patriarchy and the titular young girl runs away when she realizes she doesn’t want to live the life they’ve set for her. As she goes off discovering the world, she is bravely indifferent to questioning everything and everyone she comes across, making this kind of a fairy tale for teens (there are some pretty violent parts here) with a strong message about not being afraid to speak up and challenge authority. Kate Beaton brings us home with her every Christmas. Every year around this time, Kate Beaton goes home to visit her family for the holidays and, while there, she documents her stay with quickly drawn 4-panel comic strips that she posts to Twitter pretty much as they happen. Now that she’s back she’s compiled this year’s comics into an easy to browse Tumblr post. Beaton is one of the finest humorists working in comics and these charming little comics about her family give you a nice insight into how a cartoonist like her processes every moment of her life and converts them into four-panel gags.